Wondering how to be a budget-conscious shopper at Whole Foods Market? Today I’m going to share my secrets for saving money at Whole Foods. Whole Foods = whole paycheck. This has been the running joke for years and there is definitely some truth to it. 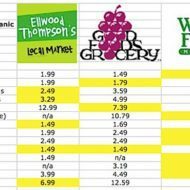 Just last year, this Business Insider article compared the prices at Whole Foods (at my local Glen Allen location) to prices at Kroger. The author purchased 31 items at both stores and the Whole Foods’ total ended up being $60 more than the Kroger total! I always knew that Whole Foods was more expensive than Kroger, but I didn’t expect such a big difference. Kind of crazy. Despite the higher prices, Whole Foods is still my favorite grocery store. Mainly because it’s clean and pretty, the produce always looks beautiful and they have the best selection of organic and natural foods. Shopping at Whole Foods makes me happy whereas sometimes shopping at other grocery stores — especially if they’re dingy and dirty — isn’t very fun. High quality food is one thing that I don’t mind spending my money on because I know it’s worth it, but Isaac and I aren’t rolling in the dough so I’m always looking for little ways to save money while still shopping at my favorite store. That’s where the idea for this post came from. Ready for my tips? This one is pretty self-explanatory. New weekly sales start every Wednesday at Whole Foods. There’s also a special Hot Deal each weekend and occasional one-day deals on Friday as well. Visit the website, sign up for the weekly emails or check the in-store signage to stay up to date on what items are on sale. Most Whole Foods stores give out monthly/bi-monthly Whole Deal books full of coupons and recipe ideas. Whole Foods now has an app with digital coupons. It’s similar to Target’s Cartwheel app, but less robust (at least right now). There’s a scrollable list with coupons and another with sale items. Last time I checked there were about nine coupons and eighteen sale items. 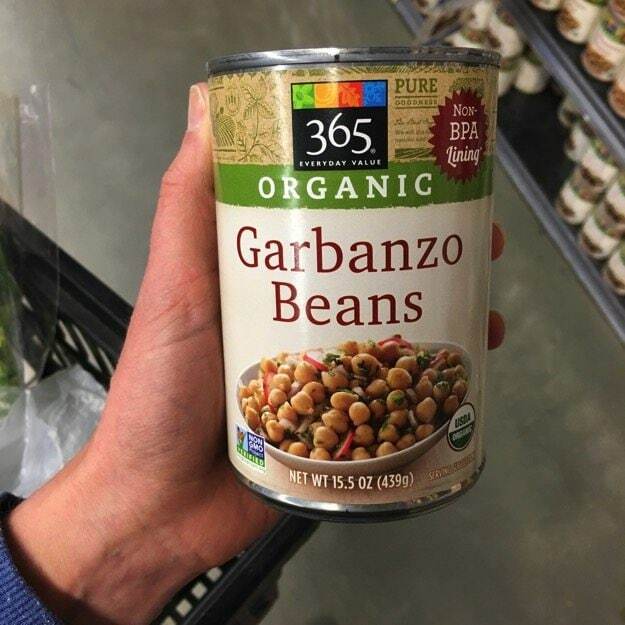 I love when I find store brands that have products I like just as much as the name brand! Whole Foods has their own store brand, 365, which is less expensive than other brands they carry. Not only do you save some bucks with 365, but they also come out with fun products to keep you on your toes while you shop. One of their recently featured products, Greek Yogurt Pops, sound delish. Look for 365 foods such as beans, grains, chia seeds, frozen veggies and stir-fry mix, frozen fruit (awesome for smoothies! ), organic milk and unique snacks. 365 products are either natural or organic products — well trusted and delicious! Looking at the unit price is a game-changer when comparing the price of two similar products, especially those packaged in various sizes. Check out the photo below as an example. 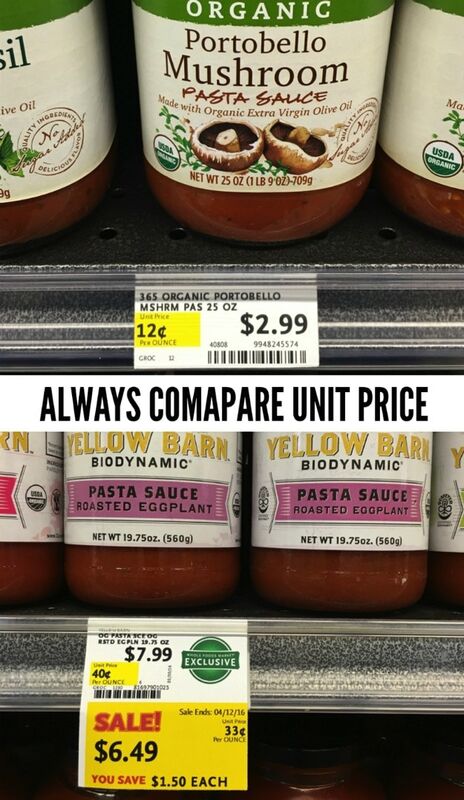 You’ll see that the 365 pasta sauce is priced at 12 cent per ounce whereas the Yellow Barn pasta sauce is 40 cent per ounce regularly and the sale price is 33 cent per ounce. So even though the Yellow Barn pasta sauce is on sale, the 365 sauce is still a better deal! Knowing what to buy organic versus non-organic can really save your grocery bill. The EWG puts out lists annually to make it easy. There are two lists, the Dirty Dozen and the Clean Fifteen. Dirty Dozen = items with high use of pesticides, usually produce with edible skin. Clean Fifteen = most of the produce on this list has skin or peels that are removed before eating or the produce is treated with less pesticides. I love bulk bins. Most of the time items from the bulk bins are cheaper than their packaged counterpart. An added bonus is that you can buy as much or as little as you want. 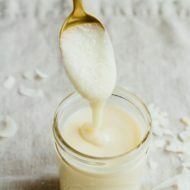 So if you have a recipe that calls for 1/4 cup of shredded coconut you can grab a small amount from the bulk bin rather than buying a whole bag of it. 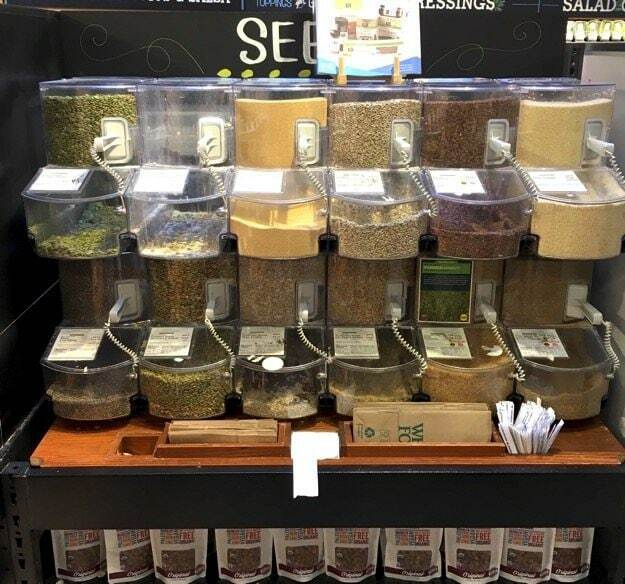 Bulk bins are also a great way to try items like chia seeds or sprouted quinoa. Some items I recommend buying from the bulk section: beans, grains, chia seeds, brown rice flour, nutritional yeast, coconut sugar, dried fruit, nuts, trail mix, popcorn. Whole Foods offers a discount of 10% off when you buy things by the case. A case usually means 12, but be sure to ask an associate because some items are different. For instance, two 12-packs of La Croix are considered a case. This discount works for items like wine, boxed energy bars, GT’s kombucha and more. Just mention that you’re looking to get the case discount to the cashier when checking out because it’s a manual discount that they have to add. Befriend your local Whole Foods butcher! Meat/fish counters usually hold weekly or monthly specials. Know what specials are coming up and plan a fun menu around the meat or fish that’s on special. Cheese. This goes back to the concept of buying in bulk. Save more money per ounce by buying blocks of cheese versus bagged shredded cheese. Not only will the cheese taste sharper, but you’ll get more bang for your buck. The Whole Foods salad and prepared foods bar is pricey and can easily jack up your grocery bill, but there are tips for saving. As you’re filling up your container remind yourself that you’re paying $8.99 per pound. Most veggies cost way less than $8.99 per pound, but some items (like bacon, salmon or shrimp) cost more per pound so you’re actually saving money! Also, check out the Value Entrée Meals at the prepared foods counter. You can pick one main dish (a veg, meat or seafood option) and two sides for a set price — it’s $8 for the veg option, $10 for the meat and $12 for the seafood at my store. Hahaha – you cannot imagine how many times I, too, have thought “Whole Foods = whole paycheck”! So thank you for these amazing tips! 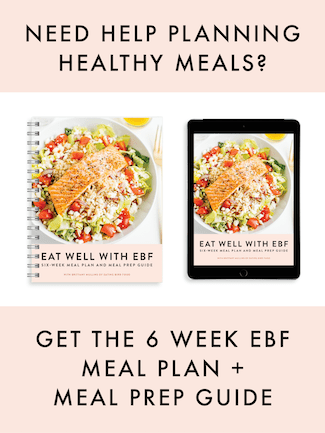 I had no clue that WF had an app too – I’ve so gotta check that out! Thank you again and happy Monday! I love Whole Foods. Just makes me happy to peruse the myriad of choices. Everything is so fresh and displayed beautifully. Thank you for the tips. I do try to buy in bulk and use the store brands whenever possible. love this – I totally buy the 365 brand and do my best not to overload at the food bar – but sometimes, I can’t help myself! 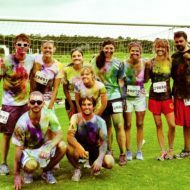 I used to buy from the bulk bins until one time the oatmeal gave me a huge allegic reaction (my lips swelled up like crazy) which told me that cross-contaminants are likely. it’s a shame because the oats were so cheap from the bulk bins! 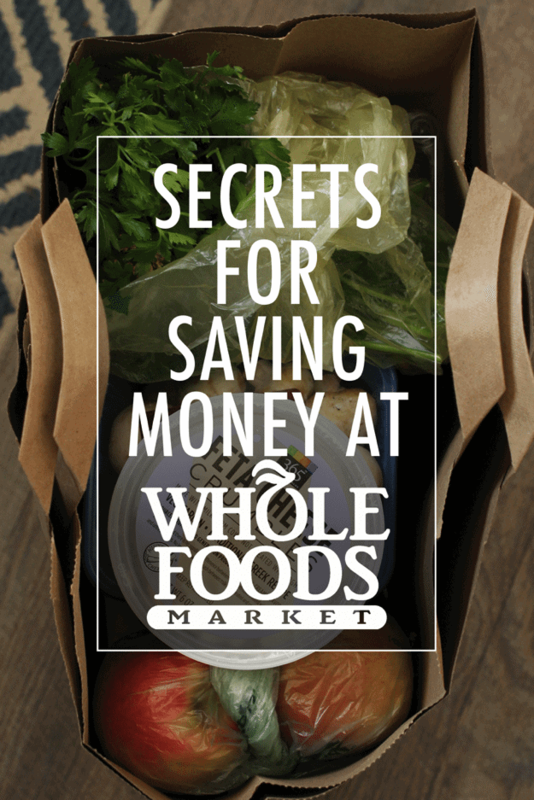 Whole Foods is my favorite place to shop so these money saving tips will come in very handy to me! I love that they came out with a phone app. that has all their coupons and sale items listed on it! I had no idea about the case discount. WOW! That’s good to know. I will definitely be taking advantage of that. omg we’re getting a Whole Foods this summer and I’m beyond excited! Thanks for your tips! I had no idea WF had coupons! I saw the lady in front of me using them the other day and I was blown away! Awesome post, Brittany! Whole Foods is my favorite store too, for all the reasons you mentioned. I also love that they source most of their produce locally. I downloaded their app about a month ago and keep forgetting to check it for coupons. Thanks for the reminder! I was so surprised when I got to the checkout and I asked the checker if she’d tried the new cashew milk I had put on the belt. She said no but did I want to try it for free – and she gave it to me for free! So at least they have good service…. I eat lunch at Whole Foods (almost everyday) and I spend way too much “lunch money”. I will definitely take these tips to heart to help save some money while still eating well. Thanks for posting! 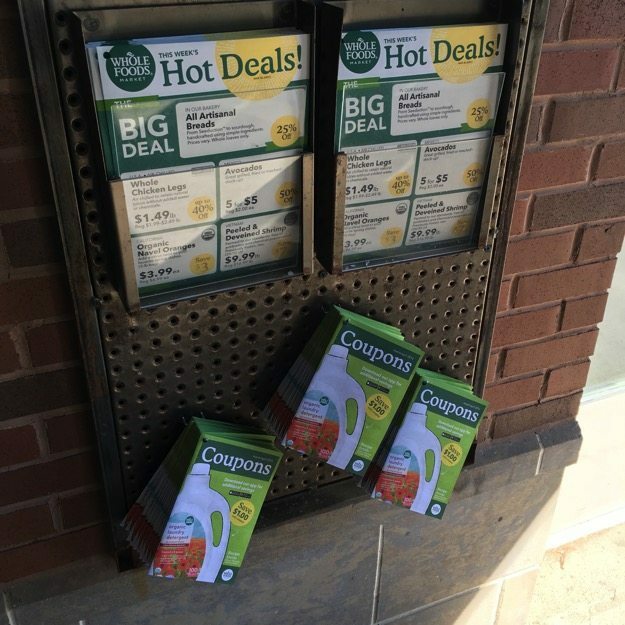 I never use coupons at Whole Foods…if I did, I think I’d be much more likely to shop there often! Another tip from a former employee: you can tell how many items are considered a case by looking for the little number on the price tag. For example, the 365 pasta sauce label you posted has a little 12 in the bottom left, indicating that there are 12 jars in a case. Also you can combine different flavors for a case discount, which is really popular for yogurt. Hope this helps! 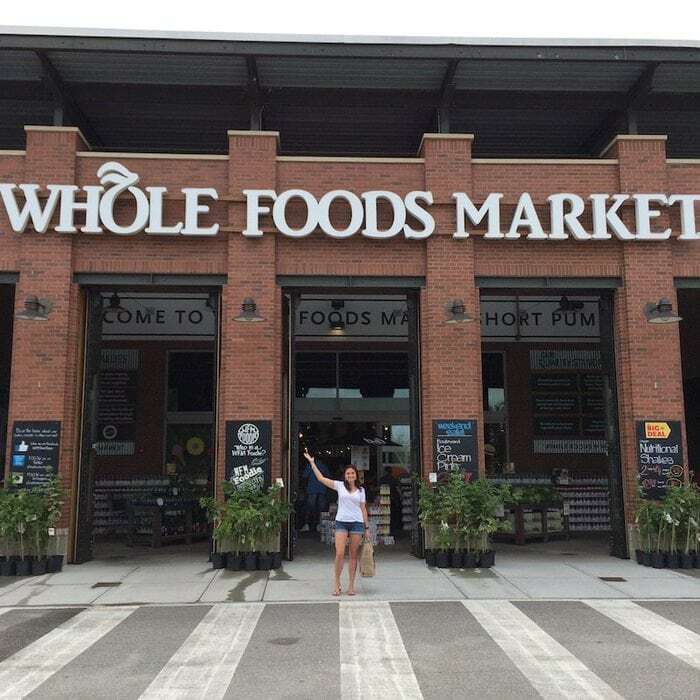 We have never lived near a Whole Foods and we’ve moved 7 times in the last 10 years! 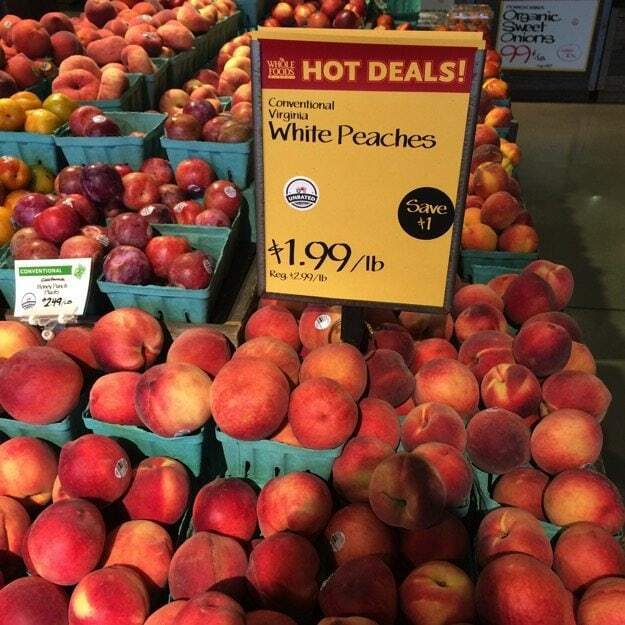 Whole Foods actually has pretty cheap prices on produce … especially their organic. When I first moved to Los Angeles, and my food budget was about $30/week, I was easily able to keep organic and clean between Whole Foods and Trader Joe’s. I stopped shopping at Whole Foods when I found out that they are able to sell organic produce at such a cheap price because they buy from the prison “farms” … with a “country” that, in compared to other first world countries, has the highest percentage of it’s citizens imprisoned (b/c prisons make money and most are imprisoned for victimless “crimes” (i.e. commercial)), shopping at Whole Foods taught me that I’m supporting slave labor. Prisoners only make $1/hour … what cheaper labor can one get in ‘Meruca? Great tips, especially if you live somewhere like NYC where all grocery stores are more expensive. I’ve learned where the 365 brand is cheaper than Food Emporium/Morton Williams/D’Ag (our versions of Kroger), especially frozen fruits and veggies which I eat a lot of in winter. Then I know where they’re overpriced in comparison to mainstream/Amazon/corner health food market, like with Bob’s Red Mill baking products, dairy, and eggs.